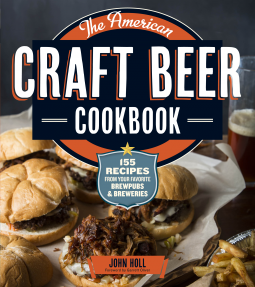 The pleasure of going to the local pub or craft brewery for a pint and a delicious meal can now be recreated at home with John Holl's collection of 175 recipes that all taste amazingly great with beer. From pub grub and barbecue to regional specialties and even breakfast fare, many of these dishes use beer as an ingredient, and all of them can be paired with your favorite brews. The recipes were contributed by brew pubs, craft brewers, and other beer lovers across the United States, and you'll love the new twists on traditional favorites, such asSlow-Cooked Dopple Bock BBQ Meatballs and American Wheat Beer Steamed Clams, as well as unexpected recipes like Crawfish Bordelaise, Chopped Reuben Salad, Beermosas, Beer Ice Cream Floats, and Chocolate Jefferson Stout Cupcakes. I've find it weird to be reviewing a cookbook, but this one drew my attention. I have a friend who is crazy about craft beers. When we go out she scours the craft menu, requests tastes of different ones before picking her drink for the night. This friend also enjoys cooking and I thought this book would be a nice addition to her kitchen. I bookmarked a number of recipies, in the hope of trying one or two over the summer. I never got the chance to try a mimosa or an ice cream float made with beer. The book was filled with information about the beers and the recipies and the pubs/breweries that serve them. I'd like to go to some of these places to try the food and beer. I'm planning on buying myself and my friend a copy of the book, so hopefully when I get the chance to try a recipie or two I'll be able to update on how they turned out!